(GGG) author Courtney Hansen is no stranger to millions of cable TV viewers. As host of Spike TV’s Powerblock show, she has become a fixture on the modern automotive scene. Ms. Hansen’s introduction to the automotive world came via her father, 27-time SCCA National Champion Jerry Hansen. She grew up emersed in the culture of mechanics, garages, and the competitive atmosphere of the race track. She decided early in her television career that she wanted to come across as more than a pretty face. A handy pair of hands is a valuable asset in any garage and if she could encourage other women to get involved through example, all the better. They don’t call her Garage Girl for nothing. GGG is presented as a confidence builder to people interested in learning about their cars. Full-on mechanics will find it overly simplistic in content, but for the overwhelming majority of drivers, GGG answers many of the questions that are often left unasked or, more frequently, assumed to be known. I know that sounds vague, but put yourself in the mindset of a non-car guy, someone who is relatively intelligent but hasn’t really considered the difference between EFI and a carburetor or the benefits of front- vs rear-wheel drive. This would be the same person who takes their car to a mechanic for air filter changes and tire inflation because they’ve simply never been shown that they can do it themselves at virtually no cost. Or think of the young driver who only knows what their friends have told them about cars. GGG addresses these issues in an open, straightforward, hey-this-is-possible manner. The author uses basic prose to explain the automotive experience from buying a vehicle to how to perform simple maintenance items yourself. GGG uses photos and illustrations to accurately explain how an engine operates, what the primary components/systems are called, and how to recognize when something major (versus minor) has gone wrong. Such information can help a car owner avoid getting ripped off by unscrupulous mechanics (there’s even a chapter devoted to the topic!). I could do without so many posed images of the author in the garage. But showing her with a handful of brake parts, a spark-filled grinding wheel, or turning a screwdriver serve to encourage the reader by showing that such work is not impossible or magic. This compliments the approach taken in the text and removes some of the mystery surrounding automotive operations and mechanics. GGG is a valuable read for new drivers. 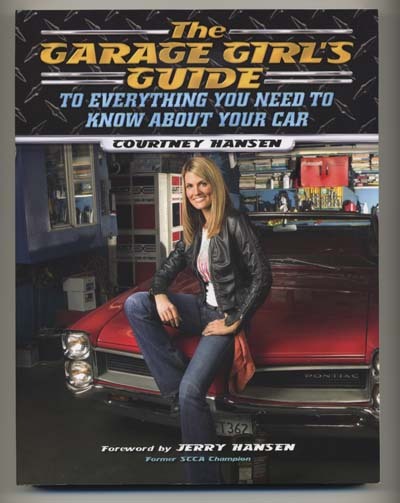 The Garage Girl’s Guide To Everything You Need To Know About Your Car will not have much for a seasoned mechanic. But for the rest of us, it is filled with valuable insights that bring us into the car’s world, remove some anxiety from the mechanics of it all, and through that understanding allow us to better enjoy the experience. That alone is worth the price of admission. Nicely done.